A regional branch of the I.E.O. The Limousin Institute for Occitan Studies (I.E.O. 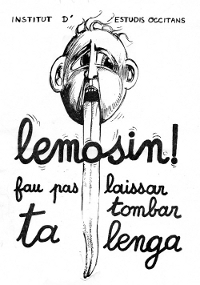 Lemosin) is the regional branch of the Institute for Occitan Studies (I.E.O.) in Limousin. The I.E.O., a cultural association under the law of 1901, was created in 1945, its aim being the support and development of the Occitan language and culture all over the Occitan-speaking territory. The I.E.O. is organised in regional and departmental branches and local circles. Besides, various sectors and associations, friends or members of the I.E.O. deal with specific activities. The I.E.O. is recognized as an association directed to the public benefit (1949) and registered as a Youth and popular education association (1986). The I.E.O. is a member of the European Bureau for Lesser-Used Languages French committee (EBLUL-France), and of the Inter-Regional Encounters for Languages and Cultures that bring together representatives from the various languages used in France. The I.E.O. is also a UNESCO club. Revitalized and professionalized in 1999, the Limousin I.E.O. now belongs to the regional cultural scene. The Limousin I.E.O. Regional Branch was created in 1977 and experienced at first an intense community-based activity : Occitan culture week of public interest, Occitan language courses, publication of books and magazines, etc. Then the activity slowed down in the 80’s-90’s. In 1998, a small group of people decided to get back on its feet and professionalize the Limousin I.E.O. association. A permanent team of five salaried employees helped by temporary ones and contract workers in showbusiness is active over the whole Limousin region, the East Charente (Occitan Charente), and the North Dordogne, which covers most of the Limousin-speaking and part of the Auvergnat-speaking areas. The Limousin Institute for Occitan Studies means more than a hundred members from all parts of the Limousin region, some of whose are elected to the Board of Directors.